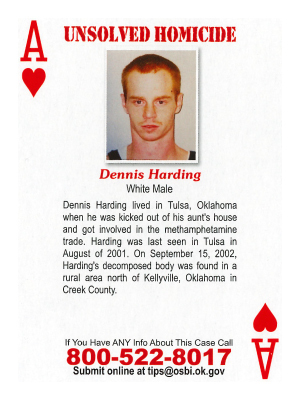 Dennis Harding lived in Tulsa, Oklahoma when he was kicked out of his aunt's house and got involved in the methamphetamine trade. Harding was last seen in Tulsa in August of 2001. On September 15, 2002, Harding's decomposed body was found in a rural area north of Kellyville, Oklahoma in Creek County.